All American Four Wheel Drive & Auto Repair builds the next generation of performance & technology. Taking News 4 where it needs to go, covering Colorado first. All new CBS 4’s weather lab, powered by the certified mechanics at All American https://allamerican4x4.com/. All American Four Wheel Drive and Auto Repair is the 4×4 repair expert for Littleton, Highlands Ranch and all of South Denver. We service all makes and models of SUVs, trucks, crossovers, minivans, Jeeps, and cars. Our ASE certified mechanics and repair specialists have the experience to properly service your four-wheel drive vehicle. Many vehicle owners have strong opinions regarding SUVs. Most either hate them or love them. The fact is, SUVs often have better resale, last longer than other automobiles and are more efficient when they are taken care of and serviced regularly. Start looking for a repair shop before you desperately need one. Check with friends and colleagues for recommendations. Check to see if the shop has transportation for customers during repairs. A lot of shops provide this now and makes repairs so much easier. Check for a shop that is really organized and clean. You might also check to see if the automobiles that are parked in the lot look to be of equal value to your vehicle. Shop equipment in the bays should be modern too. Ensure that staff are willing to answer questions you might have and that they are courteous. After all, they will be your trusted adviser and it’s nice to like the people you are working with. Check the walls to see if policies are posted on things such as guarantees and diagnostic fees. Before fully committing to a shop with larger repairs, test the shop with something small like new tires or an oil change. Look to see if there are ASE certified technicians as that is evidence you have more qualified technicians working on your SUV. Your 4×4′s suspension is what keeps you driving in stability and comfort while tackling difficult terrain. Extreme driving is no problem when you’re equipped with the right suspension system to guide you through the trails with ease. Towing a heavy load or navigating a sharp mountain curve, the suspension system protects you and your engine from absorbing excessive jolts and vibrations. With a high level of responsibility for passenger safety, it’s often tricky to determine if there is a problem. Are those squeaks and creaks normal or do they indicate a serious issue? Without the advisement of a certified All American Four Wheel Drive & Auto Repair technician, it can be difficult to tell. In the meantime, consider the possibilities below to prolong the life and durability of your 4×4’s suspension. Ball Joint Failure – A ball joint is the circular bearing that connects the steering knuckle to the axle or control arm. Ball joints create a smooth turn between the tie rod and steering knuckle. They are the pivot point between wheels and suspension, but on occasion after some rough driving and damage, ball joints may need to be replaced. The earliest sign of ball joint failure is clunking or difficulty while turning your vehicle. Extreme cases may lead to the separation of the steering knuckle entirely, the result of which would surely be an accident. Ball joints require lubrication and depending on their type – either serviceable or non-serviceable – may need to be lubricated on a regular basis. This is something easily achieved during a routine maintenance appointment upon request. If proper lubrication is not achieved, they may rust, the end result of which is failure. Shock Shaft Bends – The shock shaft, or piston rod, damps wheel movement before it reaches the vehicle. If a vehicle has been through some rough winter weather or challenging terrain, a bend can occur. A bent shock shaft will cause a very stiff ride, making suspension almost non-existent. This is dangerous for both your comfort and the security of the engine, as parts may absorb shock that shouldn’t and the 4×4′s alignment will suffer. Replacement shocks may be necessary. 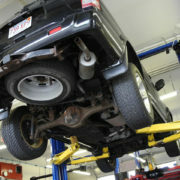 Allow an expert technician to diagnose and discuss options if your suspension is not feeling as predictable. With summer in full swing here in Littleton, Colorado, take the time to consider your 4×4′s suspension. Does it feel the same? Is the security of your suspension in question? Are rough roads beginning to make an impact on both the 4×4 and you? If something doesn’t feel right, you can count on All American Four Wheel Drive & Auto Repair to diagnose any suspension issue, talk you through your recommended repair, and take pride in performing quality work on your 4×4. Our commitment to providing the best service possible is unparalleled. From our knowledgeable staff to our certified expert technicians, All American Four Wheel Drive & Auto Repair is ready to get your 4×4 back on the road and ready for adventure! Drop by or call to schedule your appointment today. Some of the greatest adventures involve offloading with your 4×4. Amazing tales of navigating through uncharted territory come from taking your 4×4 off the beaten path. While these experiences are unparalleled, be sure to consider safety a top priority when preparing to drive out into the unknown. Take the time to read the following tips for keeping your 4×4 safe this season while still partaking in the reason you invested in a 4×4 in the first place – to have fun. Do your research – It’s just good sense to ensure that the path you choose is legal to drive on. Some of the best intentions for a day out end in unexpected fines if you avoid checking on whether or not you can be there. Testing out your 4×4 shouldn’t be an expensive endeavor. Be sure to take the time to properly investigate the area you will be driving in before firing up that engine. Be conscious of your environment – Consider the wildlife in the area. This is their home and you are a visitor. It’s best to stick to the paths cleared out by those who rode before you. Most wild animals will avoid paths that are higher traffic areas. It’s when you wander too far off course that disrupting dens, nests, and other important habitats becomes a possibility. Consider your surroundings when letting the engine scream and respect the environment. 4-wheel-drive is a must – It’s never too early to engage the 4-wheel-drive. This will help when entering the rough stuff and keep your driving experience fun, but safe. Once the path gets messy, it’s too late and getting stuck before you start becomes a real possibility. Getting stuck in the mud is no picnic and no one wants to have to make the embarrassing call home explaining why their 4×4 needs a tow. Slow and steady – If you take your time, it will be even more of an adventure! Most vehicles get stuck or damaged because their driver overestimates speed capability and no one likes getting stuck without a means to get home. Taking the time to get a feel for what type of driving is necessary is critical on unfamiliar terrain. This may just turn you into a better driver. Be honest with yourself – Each 4×4 driver has varying levels of driving skill. Respect your limits and your offroad adventure will be a blast! Push yourself too far and it may require a rescue or repair. If the conditions of the trail are less than ideal, don’t be afraid to move on to another. There are enough places in our beautiful state of Colorado that will match your skill level. Be connected – If you are traveling far from civilization or offloading alone, be sure to carry along a means of communication. It helps to let others know of the route you are taking just in case your 4×4 gets stuck in the mud or stranded in some other way. When others know your whereabouts, it encourages you to drive responsibly. Always be prepared – Accidents happen. Even the most experienced offroader makes a mistake every now and then. It doesn’t hurt to carry a change of clothes, food, and a means to camp should the need become a reality. It helps to be prepared for any emergency and one hopes those previsions will never be used. The excitement of taking your 4×4 out for its first offloading trip of the season is unparalleled, but don’t let it cloud your judgement on safety concerns. If you have a question about your 4×4′s preparedness for a summer excursion, bring it by All American Four Wheel Drive & Auto Repair for a diagnostic test. Our expert technicians will offer sound advice and present you with all options necessary to get your ride where it needs to be. With Memorial Day Weekend just around the corner, the itch to go offroading with your 4×4 is great, but before you take to the dirt paths, consider these maintenance tips. As temperatures rise, so do the risks for your 4×4 without proper routine maintenance. Consider the following before taking a road trip or an offroad adventure and keep your 4×4 safe as summer takes hold. Show your AC that you care – It’s been a while. You haven’t needed to reach for that familiar knob in quite some time, but it’s there and quietly beckoning to be turned. The questions is: When you do, what will come out? Now is the time to check your coolant level and air filter. Poorly performing AC not only infuriates the driver, but it also puts a drain on battery life, making gas less efficient. No one wants to pay more than they have to at the pump. Don’t neglect your tires – It’s easy to overlook them. Your 4×4’s tires are always getting the job done with little to no complaint, so why would you think to give them some attention every now and then? Before opening her up on the open road, give your tire pressure a check. High temperatures change the pressure of your tires. This can lead to a blow out or misalignment in the front or back end. Taking some time to check ensures a summer season free of unexpected blowouts. t’s time to check those timing belts – Heat inspires expansion of all of your 4×4’s interior belts. Now’s the time to consider them as temperatures rise. Check for cracks and damage. Don’t forget that perfectly smooth belts indicate excessive wear. It may be time to change them after all. Wiper blade switch out – Being stuck in a summer thunderstorm with worn wiper blades is no picnic. Be sure to check your 4×4’s wiper blades before heading out on a trip or mud run. Replacement blades are inexpensive and a lifesaver when the situation calls for them. Oil should be your friend, not a foe – Overheating is more common in the summer and heavy driving of your 4×4 in high temperatures could be the culprit if you aren’t keeping an eye on your oil levels. While the standard oil change is every 3,000 miles, heavy summertime use could eat through your 4×4’s oil supply faster than the average cycle. Take note of the color and consistency of the oil upon examination. If it is dark and gunky, it’s time for another change. It may simply need to be topped off and if that’s the case, do so before heading out on an adventure. Any questions? Let the experts at All American Four Wheel Drive & Auto Repair answer any questions you may have about preparing your 4×4 for summer trips and get yours into top form before an offroad excursion or roadtrip. Bring your 4×4 in for a free diagnostic consultation today and be wowed by our knowledgeable staff and educated technicians. All American Four Wheel Drive & Auto Repair knows the abuse your car went through during the winter season. Potholes and ice do a number on your 4×4’s brakes, suspension, and alignment. We’re ready to help make your 4×4’s transition to spring as easy as possible. In the winter, icy conditions cause heavy brake usage for several months straight. The increased wear on brakes can cause serious issues for your 4×4 such as worn brake pads, the result of which is brake grinding and misalignment of the front and back end of your vehicle. Ignoring these tell-tale signs could result in the complete failure of your brakes. When grinding, misalignment, or a change in the feel of your brakes is occurring, allow the experts at All American to put your worries at ease by scheduling an appointment to service your 4×4. If a brake repair is needed, we will consider all options for your 4×4, discuss the possibilities with you, and ensure that budget is a factor in our recommendation. Preventative brake maintenance can help avoid costly future repairs by taking the time to consider the care of your 4×4 in advance of any known serious problems. If continual grinding occurs while braking, damage will occur to both the rotors and drums. A squeak while braking may simply be due to friction in the brake lining, but having that squeak checked is the only way to be sure that your 4×4 is operating safely. When it comes to the alignment of your 4×4, a mild adjustment could spare the cost of complete pad and brake replacement. It could also reduce the wear and tear on your 4×4’s tires – something that could save both time and money. Running a full diagnostic on your 4×4 will point out any potential issues with the brakes and overall performance on your vehicle. Let the experts at All American ensure that your 4×4 is safe for the road and ready for some off-road action this spring. If your 4×4 is pulling to the left or right, this could be caused by a misalignment or damaged brake line. Uneven brake pad wear can often cause your 4×4 to pull as well. Grinding is not always the obvious sign of a need for brake inspection. Pay attention to your brake pedal. If you find that it is sinking to the floor at a full stop or while the 4×4 is idling, this may also be an indicator that it is time to bring it in to All American for a full diagnostic of your 4×4’s health. Feel free to contact us with any questions about strange sounds or steering issues. We are happy to get to know both you and your 4×4 better as we reach optimal 4×4 health together. Don’t forget to take a look at our Testimonials page! If you aren’t yet sure that All American is the 4×4 automotive shop for you, review what our customers have to say about service, cost, and general automotive issues. Here at All American, we will always have your budget in mind. We realize the importance of servicing your needs without braking the bank. We’ll also strive to make sure that your 4×4 is back on the road and ready for action as soon as possible because issues can often bring a good day to a grinding halt. Reach out to us today to keep your 4×4 ready for optimal springtime performance! Tire maintenance – Maintaining the tires of your 4×4 is critical for safe driving in every type of weather. Weather can change quickly and as the seasons change, now is the best time to bring in your 4×4 for a service check. Every day winter driving can cause damage to tires. Exposure to ice and snow puts your 4x4s suspension and alignment to the test. By Spring, it may be slightly off or disrupted enough for you to notice the wheel pulling in one direction or another. Potholes may have damaged tires. It’s possible that new set of tires is necessary to avoid traction issues as warmer weather brings rain and mud. Our selection of 4-wheel-drive vehicle tires is extensive here at All American Four Wheel Drive & Auto Repair. Give our Littleton expert technicians a call for advice on which tires best fit your driving needs. Traction Control – Many 4×4 vehicles come with a Traction Control System installed from the start. Challenging weather conditions demand that these systems remain engaged. They are proven to deter an automobile accident by 65% when engaged, so why take the risk? Your family will thank you later. High Range and Low Range Gears – For the most control, use low range gears. A lower range gear is your best option when navigating through difficult road conditions. They provide optimal control in less-than-optimal situations. If navigating off-road, a lower gear will keep you grounded even slippery mud. High range gears are ideal on the highway. High speeds on ideal terrain is the perfect combination for high gear driving. Suspension – At last, we’re seeing signs of Spring weather, but in snowy conditions or deep mud, raising the suspension is an option to keep your 4×4 from grounding itself and leaving you stranded. This also helps with traction when ice or mud are putting up a fight with your 4×4. Drive Responsibly – This is an obvious safety tip, but keeping a level head during difficult driving conditions is key to maintaining a safe speed and control on the road. Owning and driving a 4×4 can give off a sense of invincibility, but maintaining safe defensive driving skills keeps your 4×4 running smoothly year after year. Lowering speed increases control in poor driving conditions. It also sets the pace for those around you, maintaining a safe driving speed for all in dangerous conditions. As the weather begins to warm up, your 4×4 is in need of seasonal maintenance. Ensuring that all parts of your vehicle have survived the winter weather intact is critical for safe Spring driving. Tires take a beating when confronted with potholes and ice for months. Tire pressure suffers, which leads to lessened control. Here at All American Four Wheel Drive & Auto Repair, we will run a diagnostic to ensure that you are equipped for the seasonal change. Reach out to our 4×4 experts at All American Four Wheel Drive & Auto Repair today to set up an appointment! Your 4×4’s first line of defense from engine failure is its cooling system. Not only does it keep your vehicle from overheating year round, but it also regulates the temperature during extreme cold. This keeps the engine safe from freezing – a sure fire way to have a breakdown. In fact, a major cause of roadside breakdowns is a failure with the cooling system. Regular flushing of coolant is essential to avoid potentially costly engine problems. If a leak has occurred due to severe winter driving, this can flood your engine with coolant while draining its distribution method and opening the door for engine failure. One short term way of warding off potential engine problems is to check your coolant level and check it often. Depending on your 4×4, there are manufacturer recommended times as to when you should have your coolant flushed and refilled. Not only does this process ensure that your engine is functioning properly, but it also helps you to avoid potential build up or corrosion within the engine that can occur over time. Driving with old coolant for too long both degrades the effectiveness of the coolant and opens the door for corrosion, as the coolant itself contains an anti-corrosive. A coolant flush includes removal of all rust and dirt build up so that your new fluid will flow freely throughout your 4×4. Aside from manufacturer recommendation, there are several factors to be considered when determining if it’s time to flush your coolant. Engine size – Depending on the size of your engine, coolant may need to be flushed either more or less frequently. Coolant type – Several coolants suggest intervals for routine flushes, which should be considered. Climate – Depending on the time of year, a coolant flush may be more desirable. Extreme weather puts the most strain on your cooling system. Mileage – The current mileage on your 4×4 also dictates the need for a coolant flush. Most vehicles require a coolant flush every 24,000 to 30,000 miles or every 2 years. This can be found in the user manual of your 4×4 or bring your vehicle in for routine maintenance and we will check your manufacturer’s recommendations. If it’s time for a coolant flush or you have questions about your 4×4’s maintenance needs, contact the experts at All American Four Wheel Drive & Auto Repair today! We will keep you on the road by helping you prepare for the weather changes in Littleton, Colorado as we say goodbye to winter and welcome in spring with a routine maintenance appointment. Allow us to check your vehicle’s tires, engine, and coolant system to provide the safest 4 wheel drive experience. As always, you will be greeted with excellent customer service, as our goal is to be as thorough as possible when it comes to vehicle service and maintenance diagnosis. Let us know if you need transportation as we service your 4×4 – our customer shuttle is always free and will take you to and from your place of business or home. 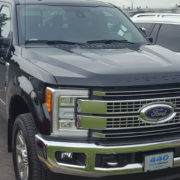 We also offer vehicle pick up and delivery. Your needs are our top priority! Four wheel drive vehicles are built to be tested by how we drive both on and off the road. This is why proper 4×4 alignment is critical throughout the year. Winter in Littleton, Colorado has a way of testing the limits of your 4×4 even further given the wear and tear ice, snow, and poor road conditions can have on your 4×4. When considering the safety of your family and your 4×4, there are several easy ways to determine if your alignment is off. Is the steering wheel off-center? If your tires are straight, but you notice that the steering wheel is settled in a position that either favors the right or left, this is one way to be sure that your alignment is no longer correct. Often, a misalignment in the toe or rear axle could be the cause. Occasionally, a bent frame may have altered the alignment of your vehicle. This is more common when driving on roads damaged by winter potholes. Does your 4×4 favor one direction or the other? Again, the misalignment of any axle can throw off the entire balance of your 4×4. Often hitting potholes or navigating on icy conditions can chip away at a solid 4 wheel alignment, leaving your vehicle’s alignment unstable. Do you find that your 4×4 no longer handles inclement weather with ease?Misalignment opens up your vehicle to vulnerability when driving through snow, ice, and even rain. If performance is no longer up to your standards, an alignment may be the answer. Is tire pressure a concern? When tire pressure does not meet the standards of your vehicle in one or all of your tires, it can lead to misalignment. Take the time to review the owner’s manual of your 4×4 or check the interior of your vehicle’s door to determine if you are driving on tires with the correct pressure. Driving on tires that are not properly inflated is dangerous for both you and other drivers on the road. It can be a direct cause for poor driving performance, skidding, and even lead to a blow out should they continue to be driven on without proper care. While 4×4 driving can make you feel invincible to winter weather, nothing derails a high performance vehicle quicker than misalignment. A midwinter maintenance appointment at All American 4 Wheel Drive & Auto Repair may be the answer. Contact us today to set up an appointment and we will ensure that your alignment meets the standards of your 4×4. We will also be sure to check fluid levels, as many directly affect the winter performance of your vehicle. Antifreeze and windshield washer fluid both play a large role in safe winter driving. Keeping your windshield debris and salt-free during poor weather conditions is imperative for safe driving. Whether you are going from job site to job site, to and from the office, or to pick up the kids, preventative midwinter maintenance will keep your 4×4 reliable and safe in even the worst conditions Old Man Winter can throw at us this year. The purpose of a fuel filter is self-explanatory. It filters your fuel. The fuel filter is located in the fuel line between the fuel tank and the engine. Gas and diesel vehicles around Littleton and Highlands Ranch, Colorado, use fuel filters. As your vehicle ages, fuel line problems actually gets worse because dirt, rust and other contaminants will settle out of the fuel and onto the bottom of the fuel tank. The amount of sediment built up after your car, SUV or 4×4 is five years or older, can be considerable. This means that the fuel filter has to work harder and will get clogged sooner, needing to be replaced more often. One symptom of a clogged fuel filter is that the engine will sputter at highway speeds or when you accelerate hard. This happens because there is not enough fuel getting through when you need more speed. Clearly, this could be dangerous if your car or SUV can’t get enough power and you need to maneuver quickly. Dirt can also clog and damage your fuel injectors. Since injectors are not cheap to replace, you don’t want to risk their integrity just to save a few dollars on replacing a fuel filter. The fuel filter is almost the poster child for preventive maintenance. It’s a small part and it’s cheap to take care of but if it’s neglected, it could lead to thousands of dollars in repair bills. The auto service schedules in your owner’s manual are important to follow and they are there for a reason. If ever you don’t understand a recommended service, just ask one of our service advisors at All American. We will be happy to explain. Please call us today for an appointment. We’d be happy to provide free transportation during any needed repairs to make things as convenient as possible.